Mens and Womens Birkenstock Sandals. All orders come with FREE UK DELIVERY! Originally engineered to comfortably fit the natural contours of the foot, this 200 year old German institution has long been associated with quality footwear. Birkenstock was the first company to introduce flexible arch support to the mainstream shoe market, teaming this innovation with a weight-distributing cork latex foundation that gently stretches, flexes and meanders to appropriately shift pressure while remaining structured and protective. The result is a supremely supple sole that considers the natural mechanics of walking, allowing optimal freedom of movement and comfort over long periods of wear and even improving circulation. Many years later, their long-lasting appeal continues to be their trademark contoured cork and rubber foot beds that with time, begin to mould to the wearer’s foot for a perfect fit and an even better feel. Designed for longevity, these moisture-wicking, breathable and shock-absorbing shoes are crafted from the highest quality materials, whether you purchase a genuine leather pair or one constructed from specially-developed fibres. Aside from their orthopaedic benefits, Birkenstocks are the go-to shoes for holiday-makers, casual dressers and even medical professionals. 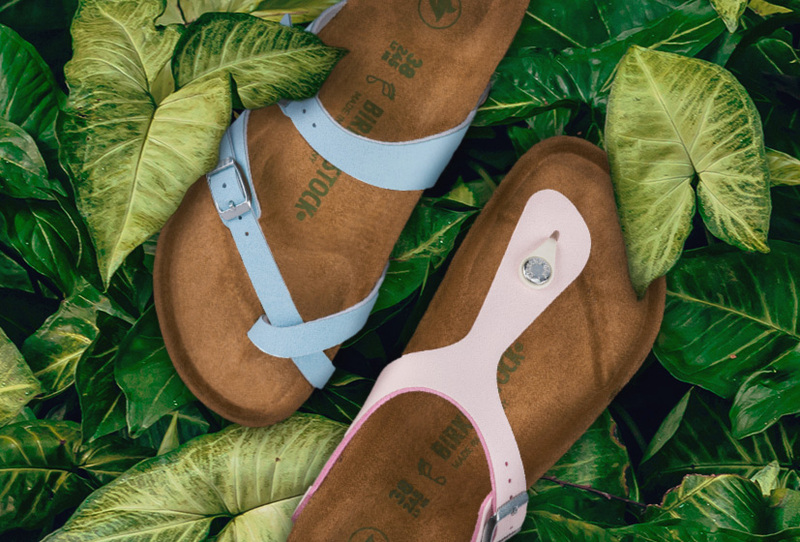 Available in an assortment of styles and a kaleidoscope of colours ranging from natural tans and earthy browns to rosy reds and pearly whites - slipping on a pair of ‘Birks’ is not only a healthy option but a stylish one too. After a successful first season, we are very confident that this manuafacturer will continue to be a popular brand for us in our store and online.